PUP are on quite the roll. 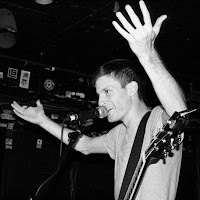 We already wrote about the sweatily awesome show the indie punk rockers played at Magpie a few weeks ago, caught on video by the folks at Blanket Fort. They've also recently finished recording their debut full-length with producer Dave Schiffman (the same guy who's worked with Mars Volta and Weezer). Today, they announced they've inked a deal to release the album through Royal Mountain Records (the label Hollerado runs) and Universal Music on Oct. 8. Stereogum declared them a "Band to Watch." And to go along with all that good news, they've got a brand new single: "Reservoir." As Stereogum puts it, "'Reservoir'" covers a lot of standard subjects — getting drunk, hanging out with girls, partying — but it’s written from the perspective of someone slowly suffocating on that lifestyle. [Frontman Stefan] Babcock explained how the inspiration came from a time when he seemed to be getting wasted every night with the same people and wasn’t moving forward in life. Nearly every line is tinged with bile and anger, and eventually all the emotional atrophy gets summed up perfectly with the line 'My lungs are killing me, I didn’t even get high.'" PUP have also got another Toronto show coming up soon. They'll be at the Danforth Music Hall with Hollerado on Friday, Sept. 13.